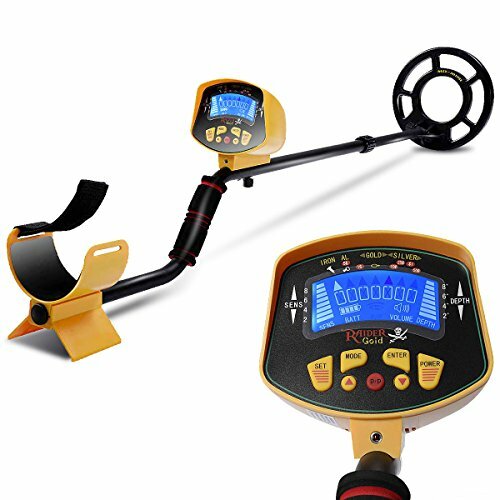 This is our professional metal detector which can be used to locate valuable metal such as silver and gold from iron relics, coins and household items. It is the perfect search engine on the beach, old castles, old battlegrounds, forests and fields and farmlands.It is also well suitable for high speed cable detecting in walls, ceilings and floors, with both electrical and water pipes can be located precisely. Don't hesitate to buy it now! Diameter of the detector plate:8"
【Wide Applicable】This metal detector can be used to locate valuable metal such as silver, gold from iron relics, coins and household items. It is a perfect detect tool on the beach, old castles, old battlegrounds, forests and fields and farmlands. 【Monomial Detector】It's available for detecting 4 different metals. They are iron, aluminum, gold and silver. Each of them can be detected individually. 【Easy to Use】With its fully automatic and adjustable handle, this metal detector is easy to use for people from different ages and levels of experience. 【LCD Display】There is a LCD display on the metal detector which shows different functions such as mode, depth and sensitivity. It is very easy for you to operate and track. And LCD lights are suitable for identification of metal in night or caliginous outside. 【Easy to Assemble】All assembly hardware included. Clear and brief instruction makes it much easier to put together. No professional tools needed. It can save much time for you.